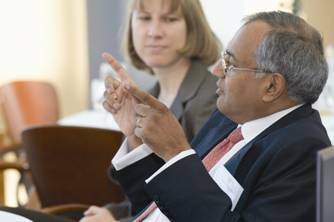 Purdue alumnus Venu Srinivasan has been appointed as president of the Confederation of Indian Industry (CII) for the 2009-10 year. Mr. Srinivasan, a 1977 graduate of the Krannert MSM program, is currently the managing director of Sundaram-Clayton Ltd. and chairman and managing director of TVS Motor Company Ltd.
Mr. Srinivasan and TVS Motor Company sponsor the annual Dauch Center for the Management of Manufacturing Enterprises/Global Supply Chain Management study abroad program “International Internship – India,” which is open to undergraduate and graduate management and engineering students. Thanks to the generosity and visionary leadership of Mr. Srinivasan, 40 Purdue students have benefited from the unique working internship in Bangalore, India, in the three years of the program. Addressing the members of the CII and media on April 22, Mr. Srinivasan commented that issues related to reviving the Indian economy, creating necessary infrastructure and promoting corporate governance will top the list of the CII’s initiatives during his term as president. A full article of Mr. Srinivasan’s appointment can be found at: http://cii.in/full_story.php?menu_id=78&news_id=2186.